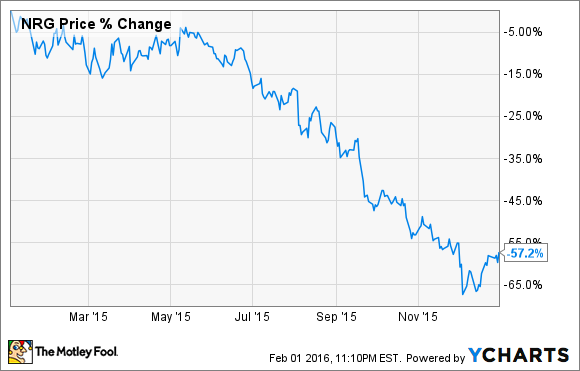 Will 2016 Be NRG Energy's Best Year Yet? There's a lot of potential for the company as it moves to separate its fossil fuels and renewable energy businesses, but as an investment, it's certainly not without risk. It's hard to say that a company could be in for its best year after its stock fell 57% the year before. But it's worth asking whether NRG Energy (NYSE:NRG), which is somewhere between finding its footing and falling on its face in today's energy environment, could have just such a success. The company invested billions in clean energy, only to see investors reject the resulting financial impact. But now, it may be time for a turnaround. Late in 2015, NRG Energy's management came out with a plan to separate its "GreenCo" from its legacy fossil fuel business. The new structure can be seen on the left, but basically anything renewable-related will either be housed in the yieldco NRG Yield (NYSE:CWEN) or in this GreenCo. NRG Energy's new structure. Image: NRG Energy. Management said that the renewable energy business will be given $125 million to get on its feet, but after that it's on its own. The idea long-term is to spin off GreenCo as its own public business, but with renewable energy stocks trading lower than they were a year or two ago, now isn't the time to do that. For now, it's going to focus on figuring out how to integrate building large projects with its rooftop solar, consumer devices and EV charging businesses. We still don't know how those segments will overlap and create a cohesive business long-term, so how the company begins to answer that question in 2016 will be key. One of the side effects of building its renewable energy business was that it added a lot of debt to NRG's balance sheet, which has been a problem lately because the power plant fleet has been underperforming. At the end of the third quarter, NRG Energy had $19.9 billion in debt, $4.5 billion of which was at NRG Yield. Only $8.8 billion was actually recourse to NRG Energy, so that's a bit of a positive, especially compared to $1.95 billion in expected EBITDA for 2016. The debt/EBITDA ratio of 4.5 isn't extraordinarily high, but investors are seeing a lot more risk in NRG's business than they'd like. If NRG Energy is going to have a great year, it'll have to reduce debt with some of its cash flows and prove that its business is on stable ground. Deleveraging could help assure investors there's value in the company. NRG Energy's stock price has fallen into the range where it could be a value for investors if operations turn around. Management has said that PJM auction results are expected to increase margins in the next two years, so there could be improvement there. Separating the renewable energy business and giving it a simpler reporting structure could also help highlight growth in that business and reduce leverage for NRG Energy. It's a high-risk company with $19.9 billion in debt, but if management can beat the expected $3.0 billion to $3.2 billion in EBITDA analysts are forecasting for 2016, there's a lot of leverage for shareholders. But be warned: 2015 didn't go as planned and there are no guarantees about 2016.